Here is Chapter One from the upcoming Healer’s Touch, book 4 of the Hearts and Thrones series, which will be out later this month. Enjoy! Marius had never seen a carriage like this one. It sat before a backdrop of sagging storefronts and fading paint, as incongruous with its surroundings as a swan in a mud puddle. Bars of gold and ivory swooped upward to outline its form, and a crystal lamp sparkled at each corner. Four dapple gray horses waited in harness. He could not imagine what even a single horse of such quality would cost, let alone four of them. A thousand tetrals? More? He pushed open the wooden shutters of his apartment window for a better view. The carriage was escorted by two others, one in front and the other behind. The escorts weren’t as fancy as the middle carriage, but they were finer than what anyone in the village could afford. Who could be the owner of this assemblage? It was rare for the nobility to pass through a backwater like Osler. He was due back at the apothecary in a few hours, but his mother had told him that if he ever saw a rich man’s carriage in Osler, he needed to tell her immediately. Apparently she’d once had a serious quarrel with a nobleman. Marius leaned out the window in hopes of seeing the great man, or perhaps it was a great woman. But he saw only servants. A coachman stood at the lead horse’s head, and a groom was draping blankets over the horses’ backs. Why would a noble personage carry a grudge against his mother for so many years? It didn’t make sense, but he would tell her about the carriage anyway. On his way out, he grabbed a bottle of tincture he’d been meaning to bring her. The carriage guards paid him not the slightest attention as he climbed down the stairs. A pair of them were going into Lev’s Inn and Tavern. Marius smiled. Gods help them if they tried the special. A quarter mile down the road, he angled onto the dirt path that led to his parents’ home. Once inside, he hung his hat on the rack and called, “It’s me.” A savory scent wafted past his nose. His mother must be cooking. She came into the entryway and folded him into a hug. He hugged her back gently. His mother, Camilla, wasn’t young anymore. She’d borne her children later in life than most women, and Marius feared that he and his younger sister had been a strain on her. She was delicate as a bird, yet he felt strength in her small frame. “Fancy. There were three carriages, actually. The guards are in orange livery.” His stomach rumbled. He hadn’t eaten since breakfast. She raised her eyes to his, and Marius became conscious of the lines on her face. She did not speak, and Marius gathered that his answer was not the one she’d wanted. “Is it the one you’re worried about?” he asked. She blinked and stammered something that wasn’t a word. Then she left the kitchen. “Mother?” he called after her. Marius shook his head as if to shake cobwebs loose. Legaciatti? Those were the emperor’s personal guards. They lived in the imperial city and would have no reason to come to a remote village like Osler. “I’m sure they’re not Legaciatti,” he called to her. He cocked his head and listened. She did not answer, but he heard banging and rustling as someone, perhaps two someones, moved around in the workshop. His mother returned to the kitchen, lugging a rucksack. “You shouldn’t be lifting that,” said Marius, reaching to take it from her. Marius blinked. “Where? I have a shift this evening.” She had to be wrong about the guards being Legaciatti. His family was of no importance whatsoever and would have no business with the Imperium. Neither she nor his father could have committed the sort of crime that would attract the attention of the imperial seat, or, for that matter, any crime at all. His parents were the most straight-laced, law-abiding people he knew. They never gossiped or gambled. They rarely even drank. She tried to push him toward the door, but he wouldn’t budge. “What about Laelia?” If the danger was real, they couldn’t leave his sister behind. Marius gaped. His father was quiet and sensible by nature, the steady counterpart to his mother’s fire. If his parents were united in their determination to leave Osler, the situation was serious. “What’s Gratian going to say?” Laelia’s live-in lover wasn’t the friendliest of men. What could his quiet, reclusive parents have done that would induce the empire to hunt them down? He stuffed his hat on his head and grabbed a blanket from the nearest bedroom. “I’ll help you fetch Laelia.” Strength in numbers, when it came to dealing with Gratian. A loud noise made him jump, and he turned. Someone was banging on the front door with something heavy. “Out the back, quickly!” shrieked his mother. Marius lost no time in following her. It appeared her lifelong fear was justified. Someone really was after them. His father yanked open the back door to a wall of orange livery, and a host of imperial guards swarmed into the house. Marius sat at the kitchen table with his mother on his left and his father on his right. Guards encircled them. His stomach was in knots, and so far nothing was happening either to alleviate or to sharpen his fears. He and his parents were being held here for some event yet to come, and the guards refused to answer his questions. His parents surely knew something about what was happening, but when he sent them desperate, questioning looks, they stared down at the table and didn’t meet his eyes. Turning from them, he looked to the guards, trying to determine if they really were Legaciatti. They did have the sickle and sunburst insignia, but did that prove anything? Anyone could make up an insignia and sew it to a uniform. The guards were intimidating, each of them carrying a sword and pistol at his belt as well as a heavy, bronze-tipped stick. Perhaps the stick was for beating people into submission. Or, now that he thought about it, for knocking on doors. So far the guards had not been violent. One had grabbed his mother when she tried to slip away, but not roughly. Marius recognized the guard standing across from the table as the one he’d seen outside Lev’s earlier in the day. “Could you just tell us what’s going on?” Marius blurted. “The emperor will be along shortly,” said the guard from Lev’s. His mother stared straight ahead, stony-faced, wringing her hands in her lap. His father, as always, was an open book, his face etched with worry lines, but he did not seem surprised. That was the oddest thing about this affair. Marius’s parents seemed to have expected this to happen. Even planned for it. Sir. Marius almost laughed. He lifted the glass and drained half of it. All at once, the guards shifted, turning toward the front entryway and dipping their heads as another man entered the room. This, Marius supposed, was the emperor, or at least someone pretending to be the emperor. He was average in height. In fact, Marius probably had an inch on him. The emperor, if indeed that was who he was, was black-haired and fine-featured. He didn’t look much like his profile on the Kjallan tetral. The emperor was known to be crippled, but this man wasn’t limping. Marius looked down at the man’s feet and saw a normal boot on the right, leather and mud-spattered. On the left was a sort of wooden shoe. He’d heard that One-Legged Lucien walked with the aid of a prosthetic. Was he looking at that famous prosthetic now? The supposed emperor turned to his mother. “Sabina,” he said, holding out his hand. Marius let out his breath in relief. This was a mistake. Sabina was not his mother’s name. These people, whether imperials or charlatans, had come to the wrong house. Marius blinked, stunned by this response. Marius’s father lowered his eyes, but he extended his hand and clasped wrists. “You can’t have him,” said his mother. Marius reeled in his seat, catching himself just in time to avoid falling out of it. He and the emperor were cousins? How was that possible? Marius shook his head. “I think you’ve made a mistake. Her name is Camilla Brosus…” He hesitated. Maybe he shouldn’t be sharing these details. His mother—Sabina?—stared balefully at the emperor. The emperor ignored her. A pair of guards directed Marius out of his chair. He rose and followed them. “Marius, he’s not a friend!” called his mother as he walked from the kitchen to the entryway in the company of the emperor and a pair of Legaciatti. They led him out of the house, where the grand carriage awaited. A footman opened the carriage door. Marius was closer to the vehicle than he had been earlier, and he looked for signs of fakery. Perhaps the lamps were cheap glass instead of crystal. Might a thin layer of gold plating be flaking off the trim? But he saw nothing of the sort. Everything looked genuine, and when he laid his hand on the carriage door, he felt its weight and its smoothness as it swung on its hinges. And those stunning dapple grays—equine quality could not be faked. He was convinced. Everything was real, and that meant the emperor had to be real, too. Emperor Lucien stepped into the carriage. Marius hesitated, and the guard gave him a gentle nudge. Marius had never ridden in a carriage before. He climbed awkwardly through the door. The carriage was enormous on the inside and could easily have seated eight. Since he and Lucien were the only ones within, Marius took the seat across from the emperor. He sank deeply into the cushions and struggled for a moment to right himself. He was used to firmer seats. Was this what luxury was like, always throwing one off balance? The footman closed the door behind them, granting them privacy. Marius was alone with the emperor of Kjall. He shoved his hands into his pockets so that their trembling wouldn’t show. Marius made a strangled noise. “My father is a carpenter, not an upholsterer,” said Marius. Marius let his breath out. This was all wrong. His parents had never lived in Rodgany, and he was the eldest child. Laelia was two years younger than he. “No, but…” He’d never needed them, and never thought he would. Appius couldn’t read either. His cheeks heated as realized how provincial he must seem to this man. When Lucien said educated, he didn’t mean someone who had learned a trade. He meant someone with a formal education, a scholar like they had at the universities. Marius couldn’t even read a street sign. “I can fix all that,” said Lucien. “I’m not asking,” said Lucien. Marius looked into those hard black eyes. His mother’s fears had been justified. The emperor did mean to take him away, and apparently Marius wasn’t going to have a say in the matter. He glanced out the carriage windows. Could he escape? Probably not with all those guards watching. Did he want to escape? He wasn’t sure. “I don’t want them,” said Marius. Marius bit his lip. For most conditions, not very. Marius was silent. He knew Healers could help the people that apothecaries couldn’t. All his life, he’d envied those rare few with healing magic. The emperor had known just where to poke him to make him hurt. And to yearn for more. Marius couldn’t respond. He felt as if a dust devil had descended upon Osler, picked up the pieces of his life, and whirled them into the air, scattering them hopelessly. 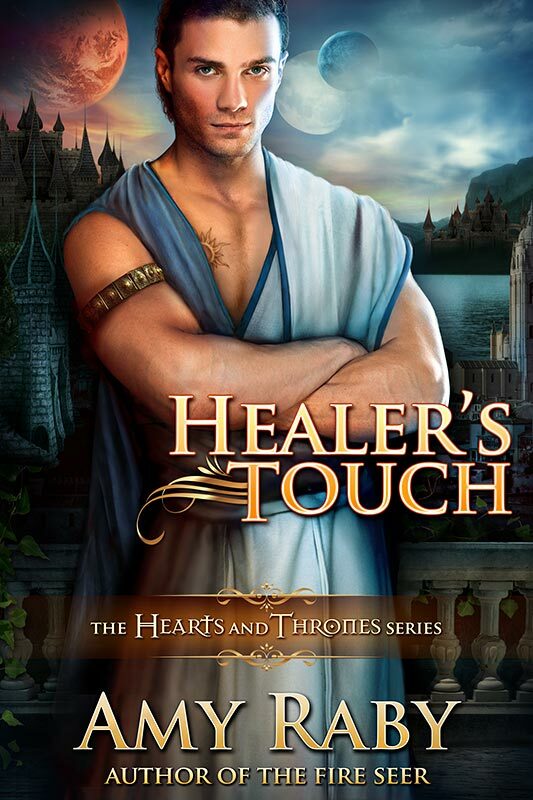 This entry was posted in Excerpts, Healer's Touch, Hearts and Thrones series and tagged excerpt, fantasy, healer's touch, hearts and thrones, romance. Bookmark the permalink. Hey all, please take a moment to check out this new and exciting piece! But seriously, how do you put out so many phenomenal books so quickly? Thanks so much! I hope to have beta copies in a few days. As for writing speed, I actually consider myself a slow writer and have tried several techniques for speeding myself up. Sadly, they haven’t worked. I aim for about 5000 high-quality words per week, and that means a book every 5 months–but really every 6, because there’s about a month of editing and proofreading as well.